The concept of zoning has existed informally for thousands of years. The Romans purposefully focused public and civic development in the Forum, an urban space for public life right in the heart of Ancient Rome. The Athenian Greeks concentrated religious development on the Acropolis in Athens. During the Moorish & Arabic Dynasties of Southern Spain and Northern Africa, development of royal palaces was centralized like at the Alhambra in Granada, Spain. It wasn’t until 1916 that the first documented and comprehensive zoning ordinance was codified when New York City passed theirs. It was created in response to the explosion of Manhattan skyscrapers that were blocking light and air from reaching the streets. The Zoning Ordinance of 1916 established a system of setbacks and height limits which would control the shape of buildings in order to provide a better street environment for pedestrians as well as protecting the property rights of adjacent landowners. Cities across the United States and Europe would soon follow and formal land zoning as we know it today was born. In fact, most major metro areas in the United States can trace the beginnings of their zoning regulations back to the 1916 NYC ordinance. 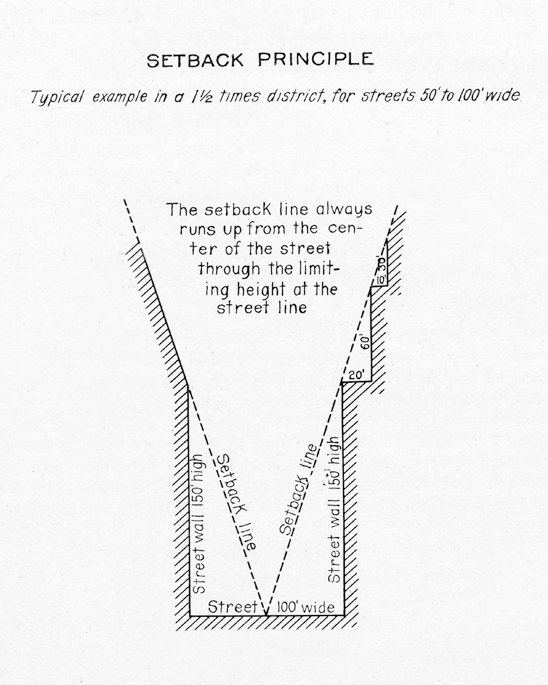 A diagram from the 1916 NYC Zoning Resolution that required buildings in Manhattan be setback a certain distance from the street to give air and light to people on the street and adjacent property owners. This is an example of form-based zoning that many cities have mimiced. Versions of one of New York City's most iconic skyscapers - The Chrysler Building. The form of the building is a direct responce to the city's 1916 Zoning Code and the requirement buildings be set back from the street for public benefit. The Chrysler Building as seen from the street. As the building gets taller it has to set itself further back from the street creating the iconic stepped form. Today there are two types of zoning codes: Use-Based Codes and Form-Based Codes. The most common is a use based code although in my opinion the most effective is a form-based code. I’ll get into the details of each in another post. Zoning ordinances are accessible to the public. You can usually find them on your city or county website. They are often extremely long and convoluted documents. So even though they are available to the public for free, most people hire an architect or zoning attorney to interpret the text for them. Fabric[K] Design offers this service in the Detroit area, in the form of our Zoning and Possibility Packages. They are perfect products for current and future landowners who are still gathering information and flirting with the idea of a future project. It’s important to interpret the zoning code as accurately as possible from the beginning. Building an illegal, non-conforming structure on a piece of land can produce some pretty hefty fines for landowners and also waste value time. By Right Development - a type of development that a landowner is legally entitled to build based on the zoning ordinance. By-right development does not require any special exceptions, permits, variances or review from a Board of Zoning Appeals. Yard and Setback - A yard is legally defined as a the area of a property that is not covered by a principal structure. Yards are usually defined by setbacks - a horizontal distance away from a property/lot line that a building cannot go past. There are typically yards on all sides of a building defined by rear, front and side setback lines. Lot/property line - A line the defines the legal boundaries of a piece of property. Lot Area - The area that is contained within the boundaries of the lot/property lines. FAR - the ratio of total gross floor area of all the floors of a building and the total lot area. Floor Area - the total floor area of a singular level within a building. Gross Floor Area - the total floor area of all the floors of building. Off Street Parking - number or spaces for vehicle parking required to be located on the property. Use - The purpose or activity for which land and any structures built, will be used, occupied and maintained for. Example. Residential Use. CURIOUS ABOUT A POTENTIAL DESIGN PROJECT? OUR ZONING AND POSSIBILITY PACKAGES CAN HELP. LEARN MORE!